It's like going back in time. Leave your transport at the nearest road-side and walk the last few minutes, through coconut groves to your home by the Arabian Sea. Palm trees and peace! 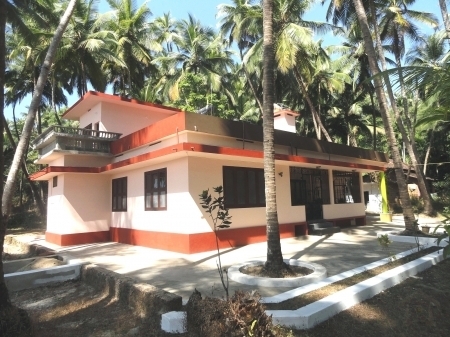 Malabar Cove Beach House offers three double en-suite rooms - each overlooking the Arabian Sea. Set in a Coconut Grove, Malabar Cove Beach House is a beautiful place to hide away. Simplicity with comfort. A laundry service is available but visitors sometimes like to try the old methods! The early morning thwack thwack throughout the village is rather comforting as washing is bashed on rocks outside the other houses within the community. Wander (or drive) along the famous four kilometre Drive-in Beach. Ayurveda and Yoga available. If you enjoy seeing a coast-line the way it was made, then Malabar Cove is the perfect place from which to explore Kerala and fall in love with its beauty and its people. Go on ... treat yourself! As most guests like to be out and about exploring the local area - and further, only breakfast is included in the tariff. In this way, guests are not running to a fixed time-table when it comes to meals. Food can be purchased from the in-house menu. Staff prepare very good Keralan meals and European style snacks. There are some interesting restaurants within half an hour of driving. There is a good take-away local facility which sells very good Keralan food. There is a cafe on the near-by Drive-in Beach. Cold drinks, including alcohol, can be purchased locally. The well water is safe to drink but is always boiled for guests. Sometimes herbs are added to the water as an aid to digestion. If guests prefer bottled water, it can be purchased locally. North Kerala is famous for its beautiful coast-line as yet undiscovered by many travellers. The Drive-in Beach of Muzhappilangad is famous for having access to vehicles. People enjoy driving along the four kilometre beach, skimming the waves. Twin beds can be arranged together for double. Smoking outside - including roof terrace. Complimentary breakfast. Other meals can be prepared if required. Ayurveda Room for Ayurveda Treatments. This room can be taken over as extra Guest Accommodation for parties over six persons.